Does anyone else have a love hate relationship with crepes? I love them. I love how versatile they are and how delicate and simple. But cooking them can be a major pain. I tend to get flustered quickly and give up when I can’t get them to cook without sticking. A few weeks ago I got a set of GreenPan non-stick pans. I’m pretty sure I’ll be making crepes every weekend from now on. These pans are amazing! 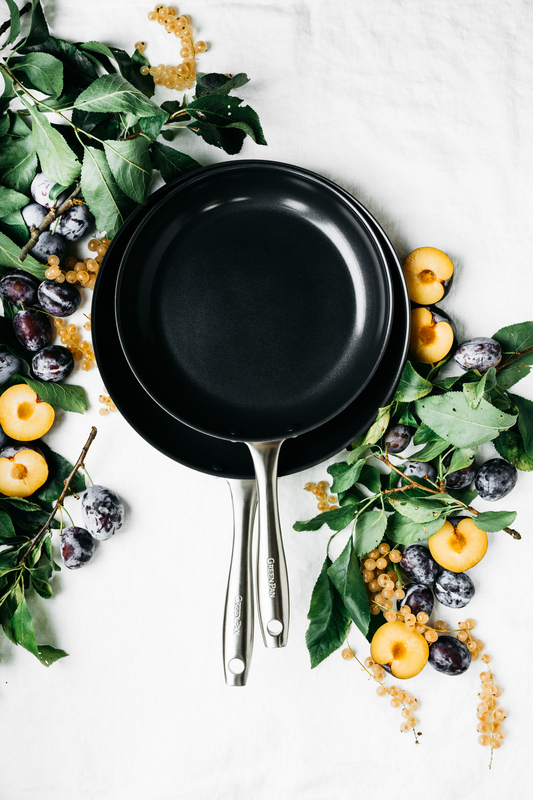 They’re made with a unique sand derivative that performs better than traditional non-stick and doesn’t contain any of the toxic, carcinogenic chemicals that usually make no-stick problematic. Also, you can use metal utensils in most of their pans since the coating is reinforced with diamonds for extra durability (that’s right, diamonds!) and they’re dishwasher safe. Win, win, win. I can’t wait to use them for other things too. I’m thinking eggs, hash browns, fish, veggie burgers etc. 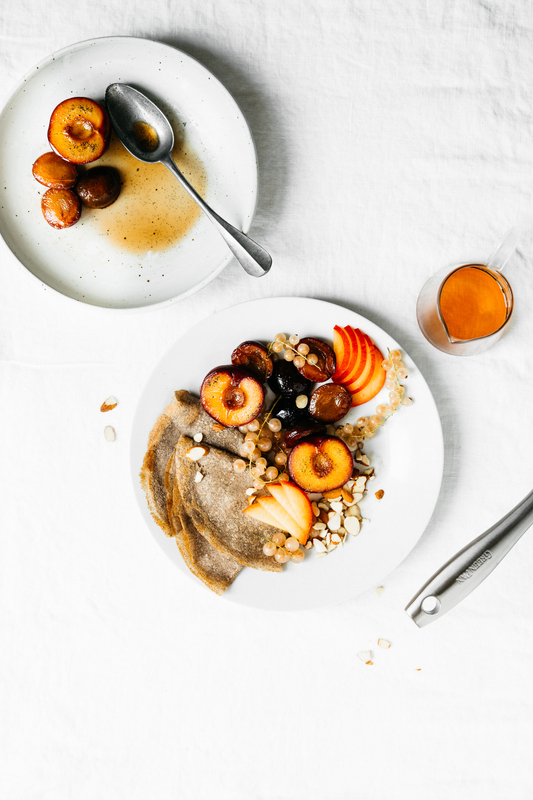 What do you love to eat, but hate to cook because it sticks? 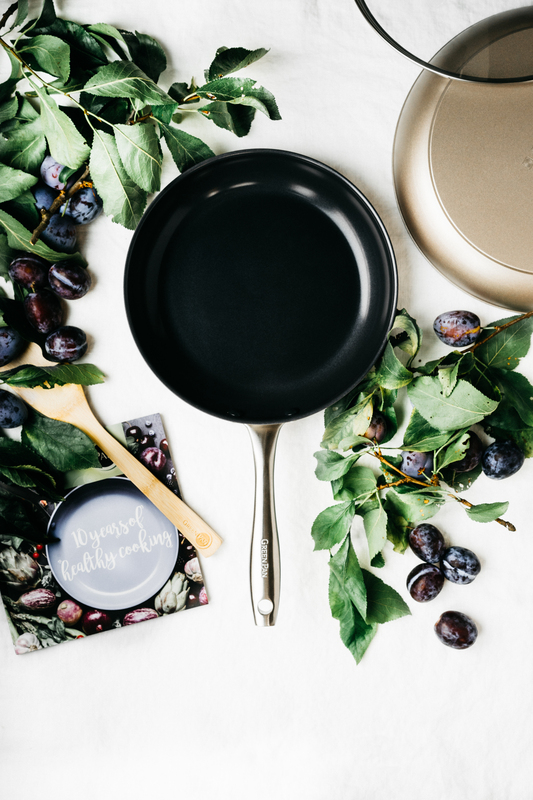 Now through September 24th you can get any GreenPan fry pan including the Limited Edition 10th Anniversary 5-piece Set in bronze for 20% off. Shop here. *This post was sponsored by GreenPan. Thank you for supporting my work by supporting my sponsors. All thoughts and opinions are my own. Combine everything in the container of a high-speed blender and puree on medium high until completely smooth. Heat a 10” GreenPan non-stick fry pan over medium heat until a sprinkling of water sizzles gently when it hits the pan. Lightly grease the pan with coconut oil. Add 1/4-1/2 cup of the batter to the pan and immediately swirl the pan around until the batter coats the bottom of the pan in an even layer. Cook until the edges start to brown. Slide from the pan onto a plate until ready to serve. In a small bowl, rub the vanilla bean seeds into the sugar with your fingers until fragrant. Heat the coconut oil in a medium skillet over medium high heat. Sprinkle the sugar into the pan then place the plums in the pan, cut side down. Allow the plums to cook for a few minutes. The sugar will dissolve and begin to caramelize. Add the bourbon and continue cooking until the plums are soft and lightly golden on the bottom. 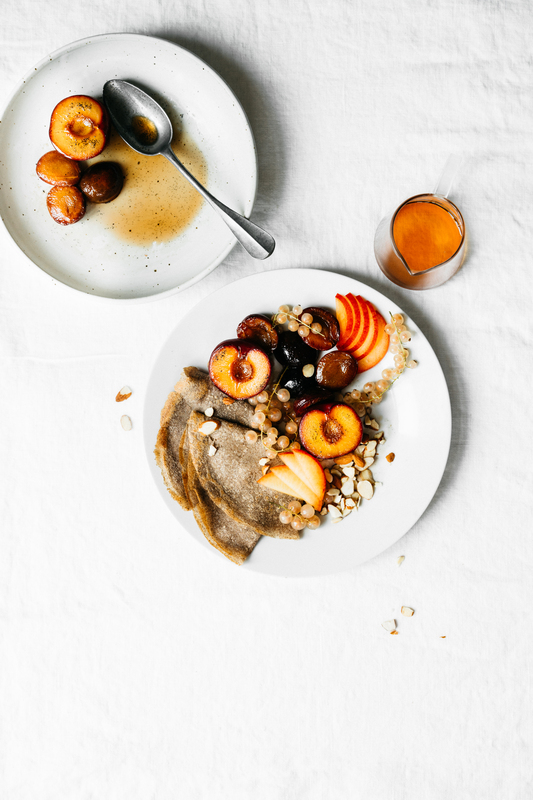 Serve the crepes with the plums, slivered almonds, maple syrup and currants. Ok, this photography is gorgeous. Also the recipe sounds amazing. I have already pinned it so I can give it a try. Yay! Thanks so much and enjoy! Utter beauties! I’m captivated by your beautiful food, as always. I have a love LOVE relationship with crepes, but I can never remember to make them for some reason. Thanks for the inspo!! 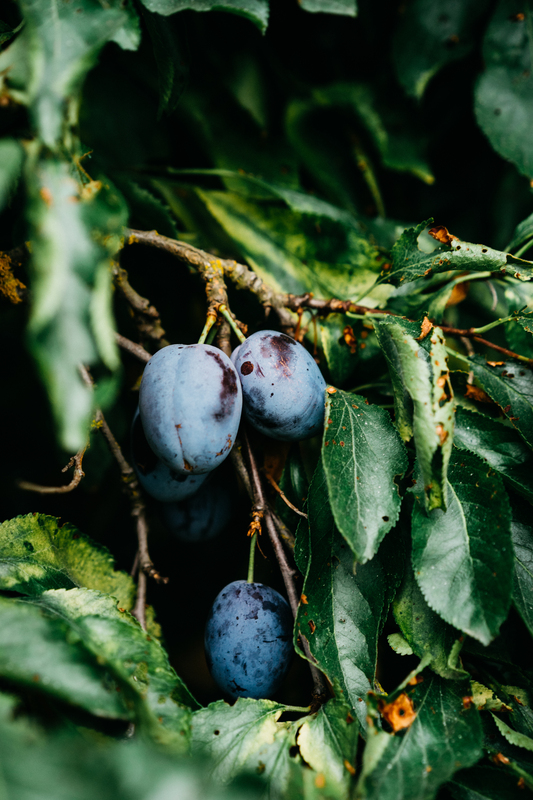 That plum pic is so beautiful! Everything about this looks super great! Can’t wait to try! 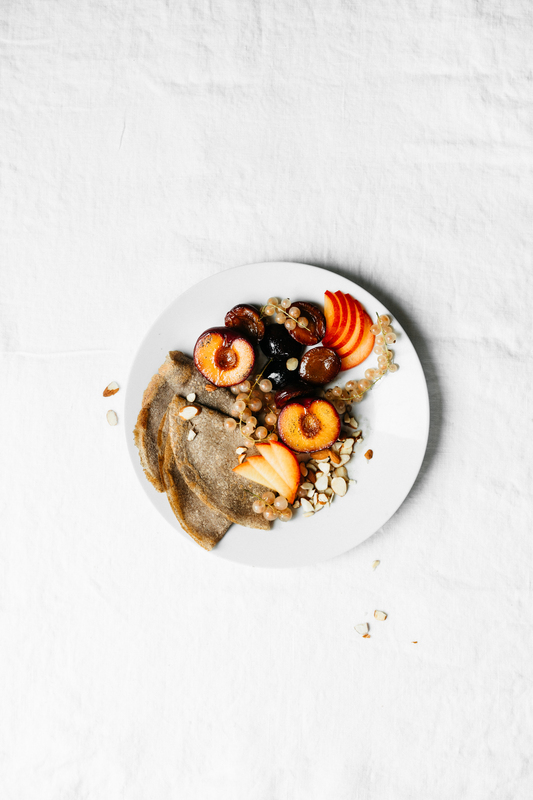 Big big fan of buckwheat crepes but for some reason I have never attempted them at home. Will need to rectify that! So.Real. 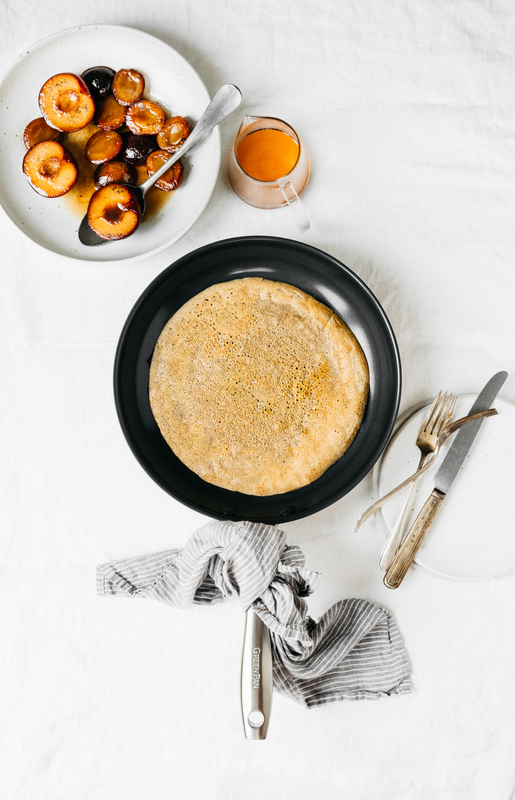 Definitely give it a try…making crepes has never been so easy! I’ve only ever seen the blue color of these pans, but I LOVE the black. And these photos and crepes look like absolute perfection. (You’re stupid talented.) xo.